Cyrtomium fortunei clivicola: Hardy Ferns Direct by PlantsToPlant. 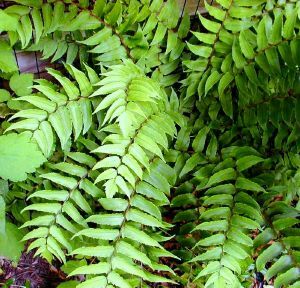 It is true of course that ferns have no beauty of flower, but they more than make up for all that with the rich diversity oftheir foliage, in many shades of green. They can grow in areas which would challenge just about any flowering plant and they add texture and structure to planting schemes. Cyrtomium fortunei clivicola, one of the ‘Holly Leaved Ferns’ which has a much broader leaved but symmetrical appearance and is evergreen with pale silvery green foliage. A beautiful fern with arching fronds composed of lance-shaped segments along the frond stems. Perfect for a shady spot in a border, container or rock garden.